I’ve been considering resurrecting Gigoit.org. In addition to finding people to donate items to, one of the essential features on the development roadmap for that site was finding nonprofit organizations that needed material donations. It’s been a long time since I looked at that data, so to get a better handle on what was available and how it was structured I decided to build NonProfitLocator.org. 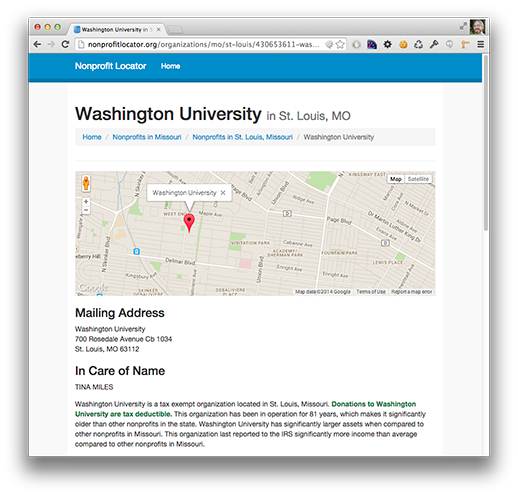 At the moment It’s an early version, basically a minimum viable product that displays tax exempt and nonprofit information in an easy to read format, performs some comparisons on an organization’s data compared to others nearby, and allows you to find nonprofits in a geographic area. I plan to further flesh the site out in the coming weeks with enhanced tools, paving the way to use this data with other projects. Posted October 9th, 2014 in Tools, Uncategorized.